Ha! I did it! 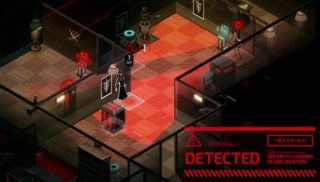 After hours of subroutines and advanced 3D GUI's, I've finally stolen Invisible, Inc's upcoming trailer and... Wait, what do you mean it's on YouTube? Well how about this intercepted communique detailing the procedural turn-based stealth game's Steam Early Access release on 19 August? They've got that, too? Honestly, I don't know why I bother. You can find details of the game's recent improvements over at the Klei forum . I'm looking forward to trying this one out, because—to state the obvious—it has stealth, permadeath, procedural generation and turn-based combat. That's many of the words I like packed into one single description.